It’s the laundry room makeover project that went viral! 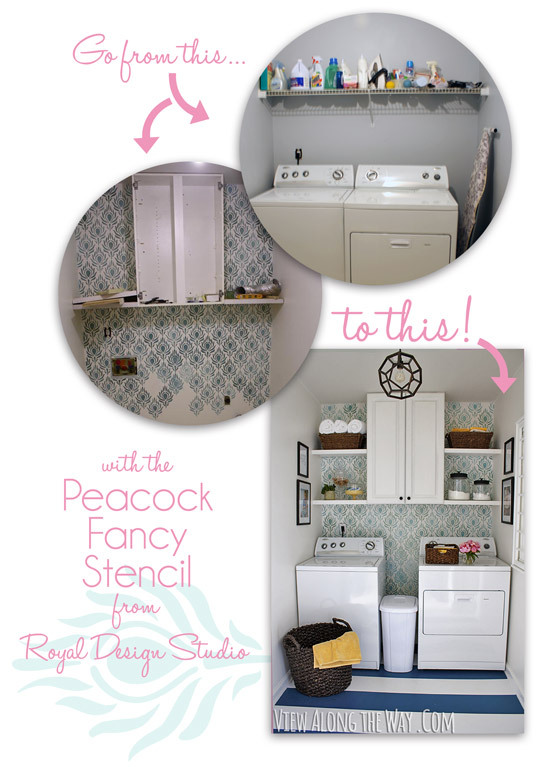 As soon as we saw DIY blogger Kelly Marzka’s gorgeously updated laundry room featuring our Peacock Fancy Stencil on the feature wall, we knew it was something special! Of course, we were super happy to share it in this Stencil Ideas for Laundry Rooms post here, but we were THRILLED for Kelly to learn that her laundry room was spotted by none other than Better Homes and Gardens-and tapped to be one of their “I Did It” features in the magazine for June 2013. The photo above shows the adorable “after” shot, but this room wasn’t always so lovely…. Kelly completed a laundry list of amazing DIY projects for this little jewel of a room, which she details out on her blog View Along The Way. Let’s face it, laundry rooms are often far from glamorous, and this one was no exception, but Kelly had a vision and a plan. 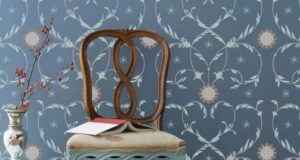 Lucky for us, her plan included our Large Peacock Fancy wall stencil from the Moroccan Stencils Collection. 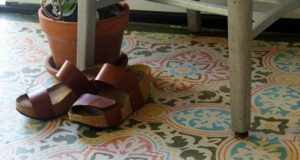 As the winner from our giveaway at last year’s Haven Conference, Kelly ended up taking home the basic stencil tools she’d need to go from newbie stenciler to experienced decorista, including our Stencil Brushes and Stencil Cremes. In fact our Patina Green Stencil Creme Paint was used for the laundry room wall stenciling, and we think you just can’t go wrong with shimmering jewel-toned peacock feathers!! In a matter of just a few short days, this uninspiring little room did a complete 180 and what was once an eye sore had suddenly transformed into a bright and cheery focal wall. 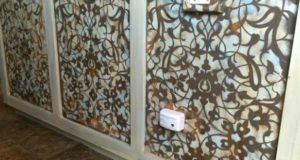 The all-over stencil pattern creates the perfect backdrop for the made-over space, and adds a little incentive to tackle those boring laundry chores! 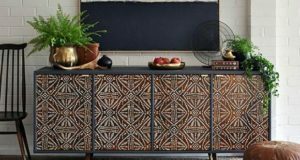 We loved following her step-by-step DIY process on her blog and are so happy to see the fruits of her labor featured in the magazine. 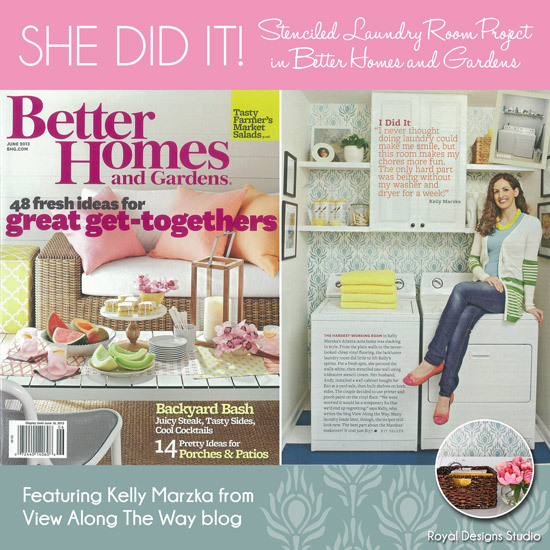 Be sure to check out this cute post Kelly did on the Better Homes and Gardens blog about her fun magazine shoot day! I live in London The final size was at the top end of the $45-$49 billionrange that market sources flagged late on Tuesday followingoverwhelming demand in excess of $100 billion. That eliminatedthe need for the company to tap the euro and sterling markettoo, as originally planned, leaving some investors disappointed. Yes! Finally someone writes about auto retro do ślubu siedlce.